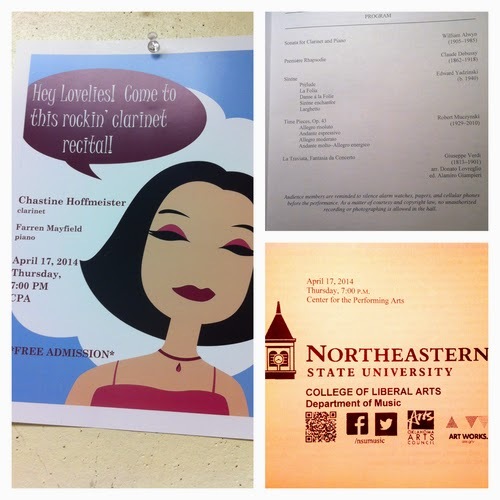 Recitals and Tigers and Gigs, Oh My! I had a blast playing a guest artist recital and teaching a master class at Northeastern State University in Tahlequah, Oklahoma this week. A huge thank you to Dr. Anne Watson for inviting me and to all of her wonderful students who participated in the master class and attended the recital. The weekend before the recital, my husband and I went to Monroe to play a classical concert which included Enescu’s Romanian Rhapsody No.1, Schumann’s Piano Concerto in A minor, excerpts from La Damnation de Faust, and the world premiere of Mel Mobley’s Labored Breath. I had never played the Romanian Rhapsody before and had to buy the transcription for clarinet and piano for a future recital, I feel like I’ve been missing out! In between rehearsals, I spotted this tiger statue and had to take a moment to get this photo op. Tiger embouchure and hand position jokes are welcome! And of course, whenever I’m in Louisiana I have to binge on awesome Cajun food. 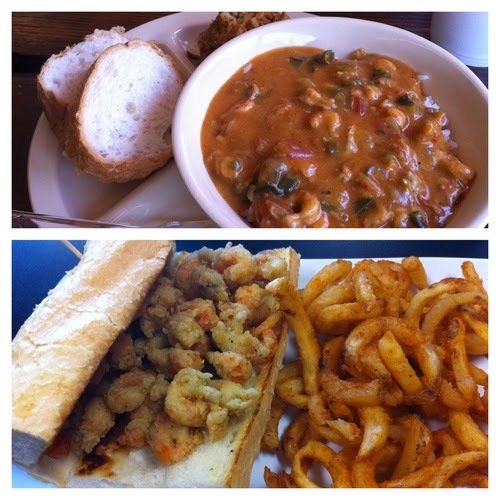 Crawfish étouffée and po’ boy sandwiches, yum! There are only pops and children’s concerts left for the rest of the season so it should be pretty stress free. This is also a good time to start registering for some more races since I have not done one since last month’s Rock ‘n’ Roll half marathon. I’m registered for the New Year’s Double but obviously I need some more races between now and then! By the way, if you have not checked out Anne’s new CD, Raretés Romantiques, it’s a really nice collection of Romantic works from all female composers and is available from Just for Winds.